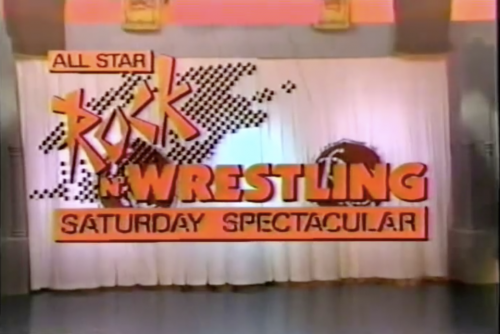 The Prime-Time Saturday Morning preview specials of the 1970s and ’80s have a bespoke magic to them, self-serving events created from scratch for the sole purpose of promoting other things elsewhere on that same network and using big star power to do it. It’s never a simple roundup, never a straight “hey, here are our new shows,” and it’s that complicated presentation that makes each special shine in its own way. The ridiculous lengths to which the Saturday Morning properties are contorted to create the narrative of a prime-time special make for some fascinating television. Fascinating, but not always good. These specials are almost always a mash-up of different brands and properties, the implication being that the network’s destination is a real place where all of these brands co-exist with each other. Much cheaper than doing an actual cross-over of shows, the specials allowed kids to see characters from a variety of shows interacting with each other – in most cases, these would be kids’ only chances to do so. 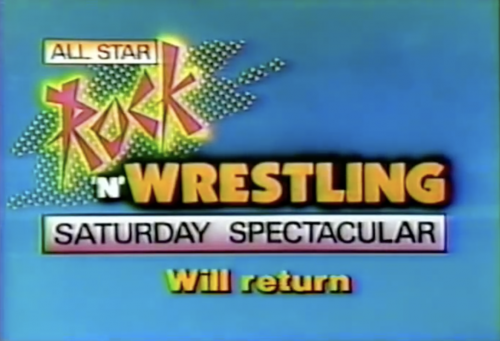 I’ve talked about a few of these before, but want to look at a particularly weird one today, 1985’s “All Star Rock n’ Wrestling Saturday Spectacular”. 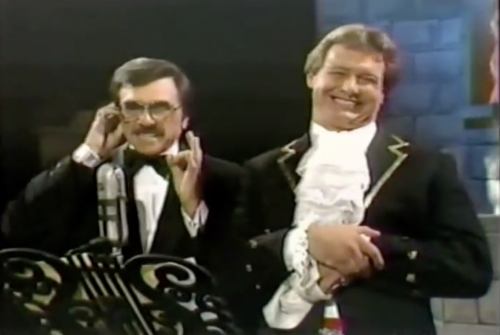 CBS had a medium-okay Saturday Morning lineup in 1985, a lot of fodder but a few standouts. Most notable was the launch of a new show, Hulk Hogan’s Rock n’ Wrestling, a lucrative extension of the insanely popular WWF franchise that explored what the world would be like if professional wrestlers focused their effort on fixing or furthering the bad things that happened in it. 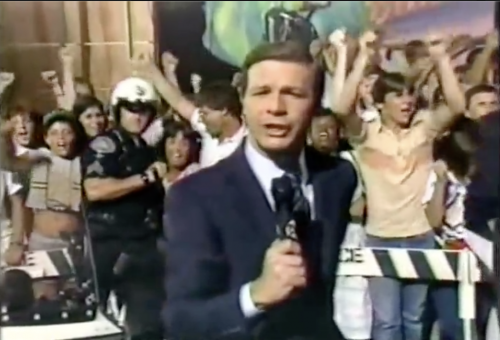 It was a big deal, and it’s no surprise that the WWF layer would be the narrative thread through which CBS’s Saturday Morning lineup would be promoted. 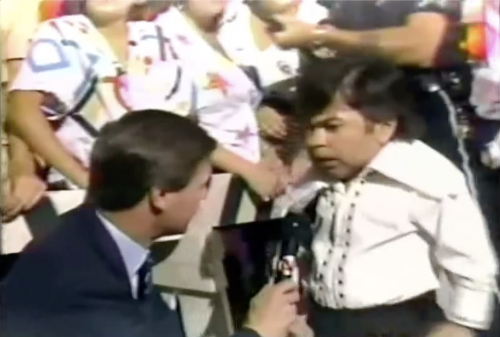 The special gets weird right out of the gate as we’re brought into a disruptive scene: Hervé Villechaize’s news program(?) has been hijacked by Rowdy Roddy Piper, who spends a few minutes strutting around on his new platform bad-guying it up, yanking a few jeers out of his audience. He settles into a throne – that was somehow already waiting for him on the set even though he had just stormed it out of nowhere – and starts a talk show that features some pretty big talent and the highlights of the new lineup. I could go beat-by-beat in illustrating the weirdness but it’s probably easiest to just say that none of this makes sense. Piper’s guests are Patti Labelle, New Edition, Kareem-Abdul Jabbar, and Pee Wee Herman. 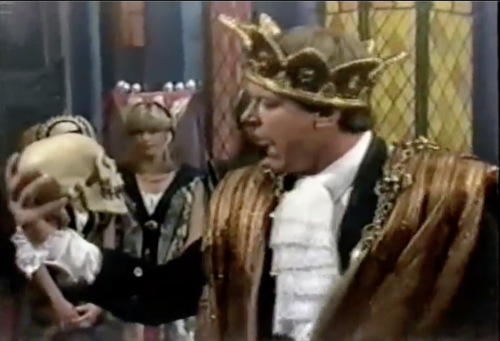 Pee Wee makes his appearance in the middle of a punched-up scene from King Lear, on a full Shakespearean set with Piper and Lou Albano in full Shakespearean garb. Because punched-up scenes from King Lear are what kids are thirsty for . The one thing that does make sense in this special is Rowdy Roddy Piper’s villainy, and he does an amazing job throughout. 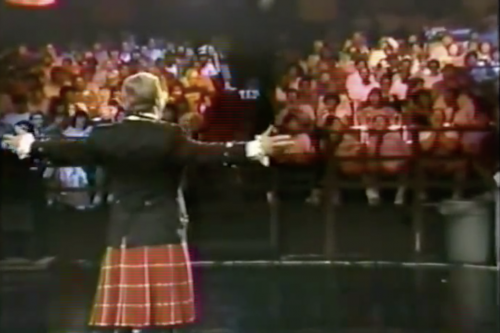 He’s at his best and the show is at its most coherent when Piper’s slamming the guests, the audience, and Hulk Hogan himself even though he’s not there. Piper’s amazing in this special and his character is completely on-brand. Every now and then we see Villechaize’s efforts to get control of his show back, alluding to a big star that’s going to help him do it. You think it’s going to be Hulk, right? Well, said big star is actually Cyndi Lauper who comes in, does a little trash talk of her own, and pied-pipers the guests and the audience alike out of the studio and presumably onto another set designated for Herve’s show. It’s fun! It makes no sense, but it’s fun! There are a few good looks at the new Saturday Morning product, but most of those clips feel like ‘gotta do’ fodder. The trailer for “Hulk Hogan’s Rock n’ Wrestling” is the only real exception. Here’s the special. They don’t make them like this anymore. They couldn’t.